In this tutorial, eight LEDs are interfaced to the Arduino Uno board. This is not complicated – it is just like interfacing a single LED to the Arduino as done in tutorial 3, but eight times over. A program is then loaded to the Arduino that will turn the eight LEDs into a "Knight rider" display. You will need to have completed tutorial 3 and its prerequisites before attempting this tutorial. The circuit diagram is shown below. 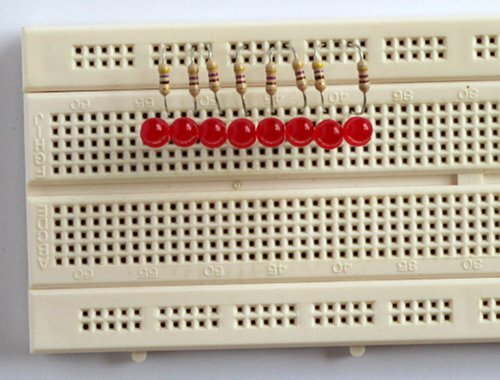 It is simply eight LEDs interfaced to the Arduino pins 2 to 9. 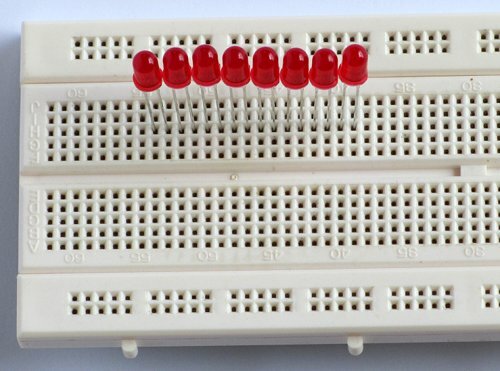 Place the LEDs next to each other in the breadboard so that the anode (longer lead) is at the left and the cathode is on the right. Insert the 470 ohm resistors connecting one lead to the LED's cathode and the other to the top rail. Join the anodes of the LEDs to pins 2 to 9 of the Arduino from left to right using single-core wire. 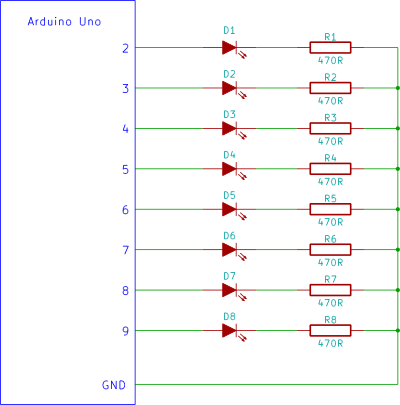 Join the top rail to one of the GND pins of the Arduino. When finished building the circuit, connect the Arduino to the PC via the USB cable. The Knight Rider program listing is shown below. Copy it and pasted it into the Arduino IDE. Load the program to the Arduino and if the circuit was built correctly, your knight rider circuit will start operating.